For Existing & Prospective Advertisers: What’s HollywoodChicago.com? Please submit this ad form for ad rates, packages and general advertising information. National advertising for HollywoodChicago.com is sold by IndieClick. IndieClick represents unique audiences on important online destinations for music, film/entertainment, fashion, culture, gaming and community. IndieClick provides advertisers with access to more than 50 million unique people on 200 relevant media properties through high-quality ad units. HollywoodChicago.com is one of the freshest and most compelling voices on the online arts and entertainment scene. We combine daily film articles, discussion and comprehensive reviews and interviews with an interactive site that humanizes the silver screen and generates a loyal following among desirable demographics. We aer the largest independently owned and operated news, review and interview resource for movies, TV, DVDs, Blu-rays, video games, theater and music in the Chicagoland area. We offer reporting from coast to coast with a team of Chicago critics as well as Los Angeles and New York City correspondents. We specialize in an easy-to-navigate format that invites repeat visits and encourages interaction with membership registration. Our mailing list and giveaways also create loyalty. Our numbers are magnified with a major syndication partnership on Starpulse.com, which is a top 100 Internet entertainment property. Starpulse.com averages 8 million monthly unique visitors and 120 million monthly unique page views. We are also syndicated on Examiner.com, which is one of the fastest-growing Web sites for local news and information, as its Chicago film channel. Examiner.com attracted 12.9 million monthly unique visitors in April 2010 and serves 234 U.S. markets and six Canadian markets. The Examiner is also in print in San Francisco, Baltimore and Washington, D.C.
Chicago Film Critics Association-accredited publisher Adam Fendelman is listed on the Tomatometer at Rotten Tomatoes. 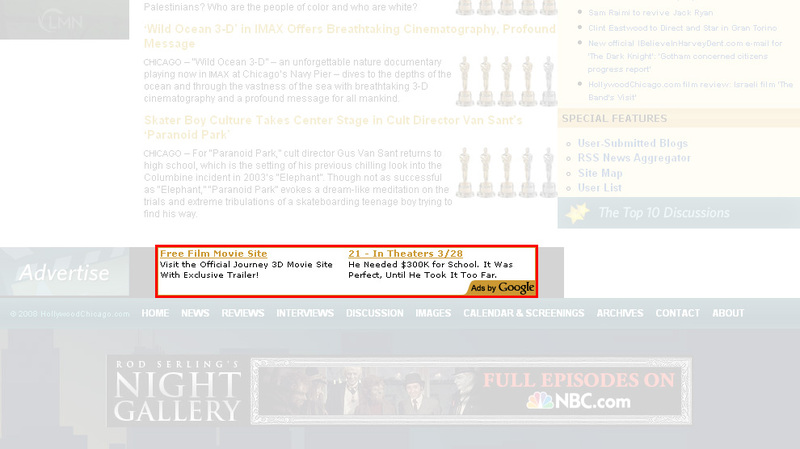 HollywoodChicago.com is also indexed by Google News and is listed on the IMDb NewsDesk. Our film reviews are also listed on MRQE. HollywoodChicago.com has been cited in the news from major publications and global media outlets including the Los Angeles Times, USA Today, CBS 2 Chicago, the Chicago Sun-Times, AOL’s Cinematical, MTV, Film.com, FOX Chicago, Gizmodo, IGN, JoBlo.com, the Latino Review, Movies.com, Reuters, Rotten Tomatoes, Variety and many more. HollywoodChicago.com is credible on NewsCred. HollywoodChicago.com has the youthful consumer locked up with the majority of our audience in the highly prized 18 to 34 age range as well as the 35 to 49 age range. This means you have direct access to the most desirable and free-spending demographic through the everyday HollywoodChicago.com site user. HollywoodChicago.com delivers to a desired upscale demographic with a high percent of users earning in the $60,000 income level or more. This means more discretionary income toward film- and entertainment-related products and more. HollywoodChicago.com is balanced between men and women arts and entertainment buffs with a slight edge in the highly desirable male customer segment. Men have been shown to be a heavy consumer of film admissions, DVDs and related products. HollywoodChicago.com draws in a highly educated Web site user. The majority of our Web site navigators have a college degree or higher. This affords a highly desirable target for higher-end consumer goods like DVD box sets, books, music and more. The majority of our audience visitors are without children in the household. This affords a large group to market toward with free-spending discretion. HollywoodChicago.com mixes it up with about one-fifth of its audience as non-Caucasian users. This reflects a near mirror with the United States as a whole. HollywoodChicago.com traffic grows consistently from the major search engines, our RSS feed and daily mailings, various business partnerships, our podcast listeners and more. We have received a wide array of news citations on other major film sites and publications. Visitor loyalty increases on a regular basis as does overall visitors, page views and page views per visit. 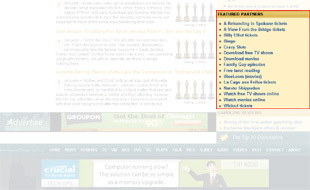 Due to our local content specialization and giveaways, we see heavy Web site usage in Chicago and throughout Illinois. We also attract users in other major U.S. film cities with hot urban markets and territories with dense populations. These are the parts of the country with higher income and more ability to spend it. The map below shows our local traffic concentration. The top leaderboard is the highest-profile ad position on the site. It’s located at the top center of the page near the HollywoodChicago.com logo and navigation bar. It can run as a standard ad or can be enhanced with the latest Web media technology. This run-of-site ad runs on every page of the site. The same applies for the bottom leaderboard ad, which appears below the footer of the site on every page. This ad appears in a prominent area on HollywoodChicago.com on the right bar. Your brand stands out in either a standard ad or the latest in Web media technology. This run-of-site advertisement appears on every page of the site. More than a sidebar, this tall and easily seen ad runs on the left side of the main page right next to featured film reviews. This is great for traditional ads or interactive Web media. Target a specific audience with callouts for products oriented within an entertainment genre, a specific film or theater review or any campaign of your choosing. This is a great place for special offers or interactive purchase opportunities. Text link ads are hot. Just ask Google. They comprise much of their massive business. Our right-bar text link ads are hot, too. They’re highly clicked, affordable and trackable. Get them clicking right to your site with targeted link lines to a film or product. Your provocative link line or phrase means more eyes to your page. This ad at the bottom of the main page is descriptive and noticeable with excellent enticement opportunity. Have questions? Interested in pricing? Ready to get started? Send in your request here.